How many times have you checked your eMail today? I'm willing to bet that you're monitoring at least one of your eMail apps while you're reading this blog. The fact that most of us are glued to our eMail makes apps like Outlook an attractive destination to plug in new functionality. Microsoft offers many different flavors of Outlook plugins, including two that extend Dynamics 365 functionality: the Dynamics 365 Client and Dynamics 365 App. Both work with Outlook, but they have different functionality and footprints. The Dynamics 365 App for Outlook is a Microsoft Office add-in that provides a Dynamics 365 assistant for Outlook desktop, web or mobile. The Dynamics 365 Client for Outlook is a Windows application that provides all Dynamics 365 core functionality directly from Outlook. Here's the pros and cons of both, which should help guide you to the right solution for your scenario. The client allows a user to access Dynamics 365 exclusively from Outlook. This is a big win for organizations fighting with user adoption, because they don't have to introduce a "new" app. Instead, the client is presented as an extension of Outlook, which is an application most users live in. This creates the illusion of adding value to an application that is always open, and not introducing the overhead of checking yet another app. The Outlook client also offers the ability to go offline. This is key for users who don't always have access to high speed internet, especially ones who find themselves traveling often. The client also allows developers to programmatically create offline filters, which can manage the size and content sent down to the client. The client requires the FULL version of Microsoft Outlook, so it doesn't work on the mobile or web versions. It must be manually installed on every computer, which creates a lot of overhead for your IT staff. Anyone who has installed \ uninstalled it knows about the angst that comes along with this task. My biggest complaint is the client causes my Outlook to perform slow, and at times brought it to a halt. Microsoft recently deprecated the client, then quickly reinstated it after the backlash from the Dynamics community. Microsoft clearly recommends that you chose the app over the client. All of this indicates that Microsoft will continue to support the client, but stop all future development and enhancements. The Outlook App supports all versions of Outlook, including the full client, outlook web access and mobile. The install is super easy, and is pushed out directly from within Dynamics 365. It's automatically available from all modern versions of your Outlook, with no local install on any of your devices! My first experience with the interface was very easy and intuitive to use. 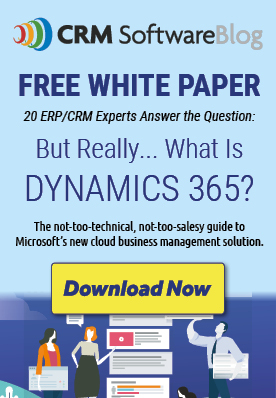 With just a few clicks, I can regard an email from a prospective client, create a lead, contact or activity associated with Dynamics 365 records. Above all, it performs incredibly fast, utilizing the Dynamics Web API to retrieve data in real time.